If you’re in the online dating scene, you have no doubt heard of Zoosk. The bustling website is one of the most popular in the United States, with over 40 million members and 3 million messages sent daily. Zoosk allows more freedom than other popular dating sites like Match.com, EliteSingles, and eharmony; whereas members of those sites mainly get matches sent to them, on Zoosk, members can create connections themselves, without having to wait to receive a match. Perhaps this is what accounts for its stunning popularity. Buy Zoosk coins to boost your profile, unlock Carousel matches, and buy gifts. The Carousel is a way for members to quickly connect with each other. You are shown profiles of potential matches, and you must immediately choose whether you would like to connect or not. You can buy 180 Zoosk coins for $19.99, 480 Zoosk coins for $39.99, and 1800 coins for $99.99. The first two options are the most popular purchases on the Zoosk iPhone app. We’ll start with the bottom line first—Zoosk’s pricing smokes its competitors out of the water. It is cheaper than Match.com, EliteSingles, and eharmony, 3 of the top-rated dating sites in the US, and gives members more freedom as well. Match.com:: At the 3-month subscription, Zoosk is not much less than Match.com, but when it comes to the 6-month and 12-month subscriptions, Zoosk’s prices are nearly half. Of course, the premise of each site is different—Zoosk is all about letting users contact each other on their own, whereas Match.com sends matches to users. Those who prefer the way Match.com works may not mind paying higher prices. EliteSingles: EliteSingles is also significantly more expensive than Zoosk (and Match.com). While the website does offer substantial sales at various points throughout the year, they still usually come out more expensive than Zoosk. 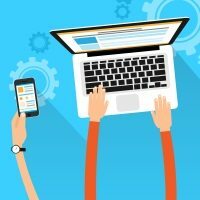 eharmony: eharmony is one of the better-known dating sites, and it uses a unique matching system to pair up couples. Members take a detailed personality quiz and are then matched up based on 29 dimensions and eharmony’s own special algorithm. Perhaps that’s why its price for a 1-month subscription is the highest of all its competitors. After the 1-month plan, its prices are still significantly higher than Zoosk, but lower than EliteSingles. 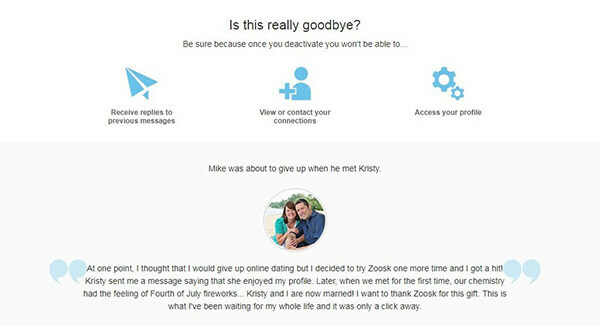 There are no activation fees when you sign up to Zoosk, but as with many dating sites, your membership will be automatically renewed unless you cancel. So if you sign up for 1 month but forget to cancel, don’t be surprised to see another monthly charge the next month. Turning off automatic renewal is simple; just go to Account Settings and change your choice under Subscription. If at any point you do decide to deactivate your account, there is no cancellation fee. Just make sure to do it before your next renewal date, or you’ll be charged for the next cycle. Also, you will be treated to a healthy dose of self-doubt before deactivating your account. And as you can probably guess, only you can decide what those answers are.